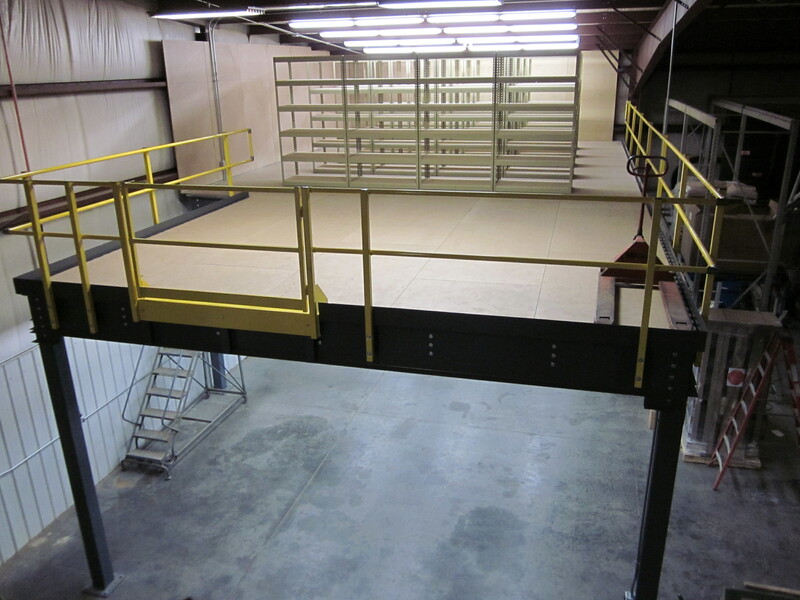 We’re often asked by customers if they’re able to install their mezzanine order on their own. The following series of pictures were sent to us from a customer who did just that, and should provide you with a general idea of what a mezzanine installation entails. 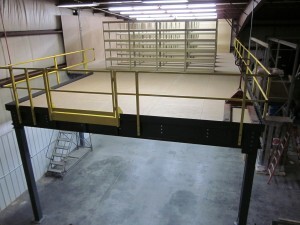 First, a little bit about the mezzanine. 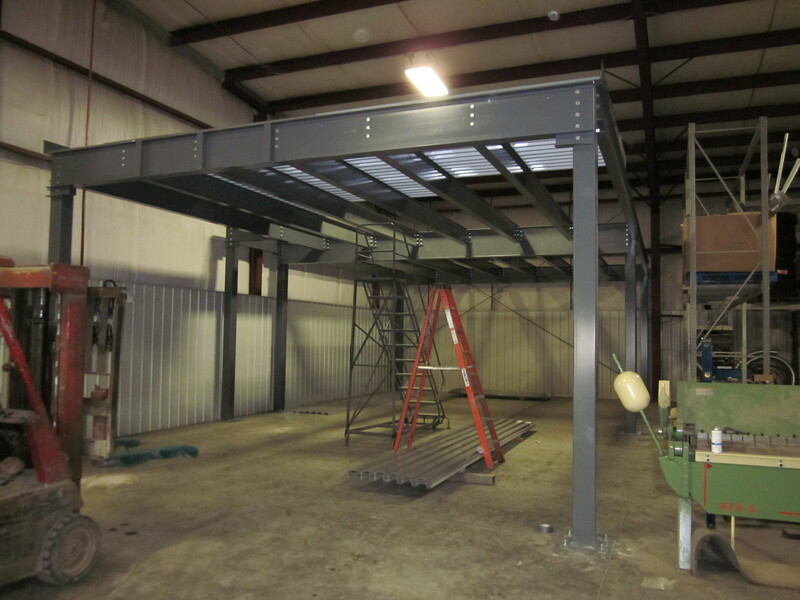 The customer was a metal welding and fabrication shop in Iowa and they were looking to move their parts storage up above the production floor. 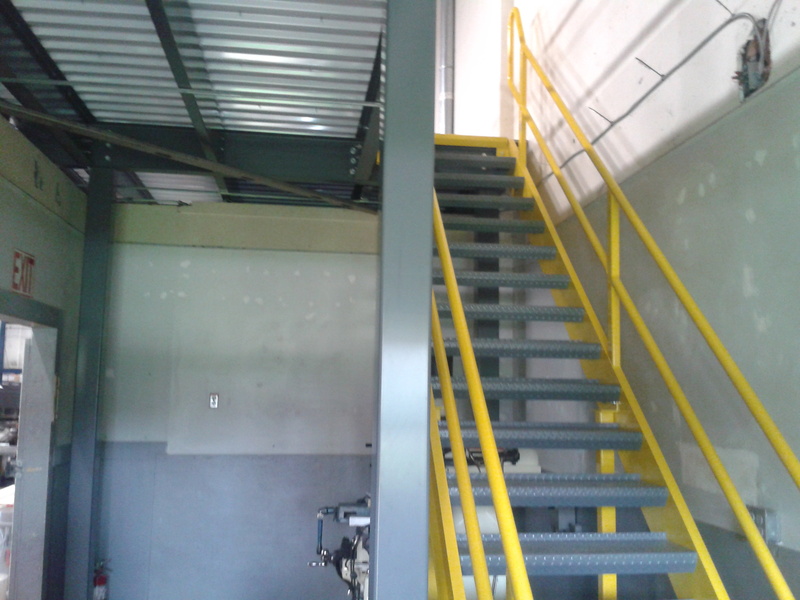 They wanted to provide their own staircase, but contacted us to design and provide them with a 46’ x 24’ mezzanine. Because this was going above their production area, they wanted to maintain at least a 10’ clearance height and to minimize the number of columns below the mezzanine deck. 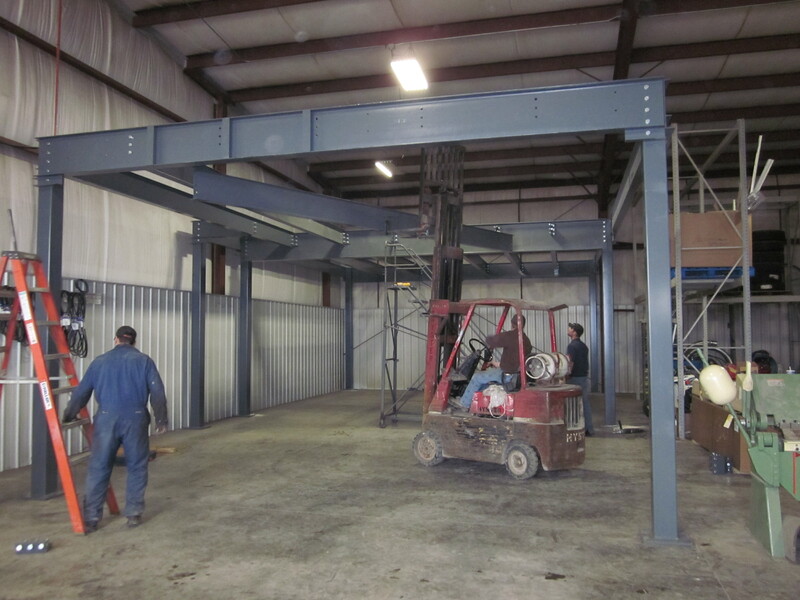 The mezzanine clear spanned the 24’ and broke the 46’ span into two 23’ nominal bays using a beam and c-section framing system. This left the customer plenty of space to maneuver around and work below. The deck was designed to accommodate both the point loads from their single rows of shelving as well as 125 psf distributed live load to accommodate 4’x4’ pallets up to 2000 pounds each. With the mezzanine situated in the corner of their building, we provided industrial use two rail handrail with a 4” kick plate on the two exposed sides, as well as along the opening for the customer’s staircase per IBC code. The decking on the other two sides was extended beyond the framing to the existing walls in order to utilize deck space and eliminate the need for additional handrails. The customer added additional resindek to their girders in order to further close off the walls and protect their insulation. Now for the installation of a prefabricated mezzanine, we would recommend a three man crew. 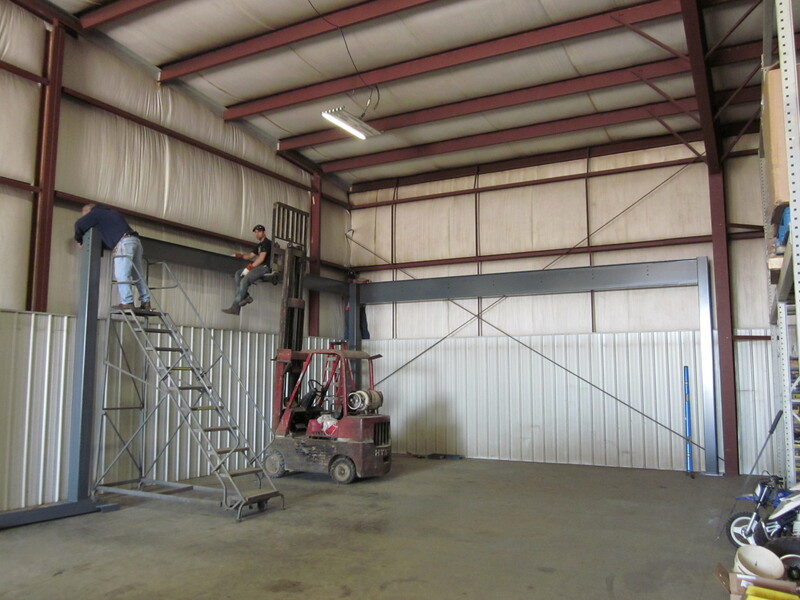 You will want a fork lift on hand, and a scissor lift if possible. As everything is typically bolted together or fastened with a self-tapping screw, there is very little in the way of specialized equipment required. Starting in the back corner and working forward, you’ll begin by positioning your columns and bolting in the primary framing members. 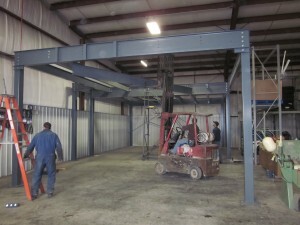 Use the forklift to position the beams and hold them in place while you connect them as the beams can be quite heavy. A spud bar will come in handy to align your bolt holes. You will need to reach inside the square tube columns to tighten the bolts. After the primary framing members have all been attached, your next task is to bolt the secondary framing members to the primary framing members. After all the framing is connected and tightened down, it’s time to anchor the columns to your floor with the provided concrete wedge anchors. Next you will install the kick plate and decking to your platform. In this example we used a corrugated roof deck for the structural component and covered it with resindek. This was done to provide the customer with a cost effective and smooth surface to work on. The kick plate is an angle that goes between the roof deck and your primary framing members. This closes off the platform so you cannot see down the corrugation of the roof deck from the sides. It also protects workers below the structure from material/tools, etc. that could roll or be kicked off the top level. The roof deck sub floor is fastened down to the framing members below using the provided self-tapping screws at every valley. You’ll then need to install the deck surface and secure it to the sub floor. The tek screws for the resindek are provided in a ribbon for use with a stand-up screw gun in order to speed up the installation process, as each 4’x8’ sheet of resindek takes 20 screws to properly fasten. We’re almost finished now. Our railing is typically mounted on the face of the mezzanine with a post that will need to be bolted on every eight feet at maximum. The railing typically ships in 21’ long pipes that are cut in the field to the appropriate lengths. The cut handrails are then connected together with the provided splices and pipe elbows, and are fastened to the saddle brackets of the posts. You will need to install the splice clips for the kick plate at every seam to establish a continuous appearance. Generally you would still need to bolt the treads to the stringers and finish off the handrail for the staircase, but in this case the customer was going to fabricate their own stair. 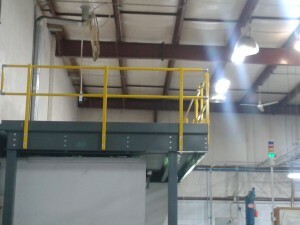 While this has been just a general overview, your mezzanine would ship with a very detailed set of assembly drawings and instructions that would go into much greater detail on the installation. This customer was pleased with the ease everything went together and the quality of the platform. This entry was posted in mezzanines on July 23, 2014 by Derick. 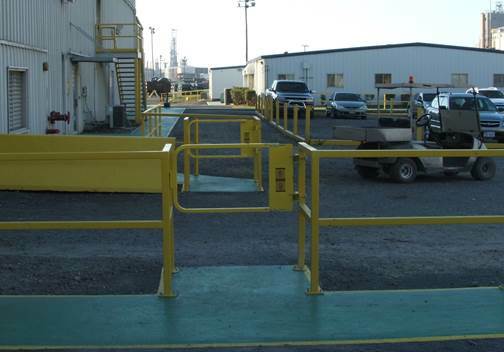 We were contacted by a customer in Texas who wanted to put up some safety gates to alert employees and visitors of their noisy location to the heavy vehicle traffic. They used our MLG ladder gates to accomplish this. The safety swing gates are installed so that the user must pull the gate towards them and then step through the opening. This way they cannot just cross the heavy machinery vehicle traffic without being alerted to the large trucks that constantly pass by. 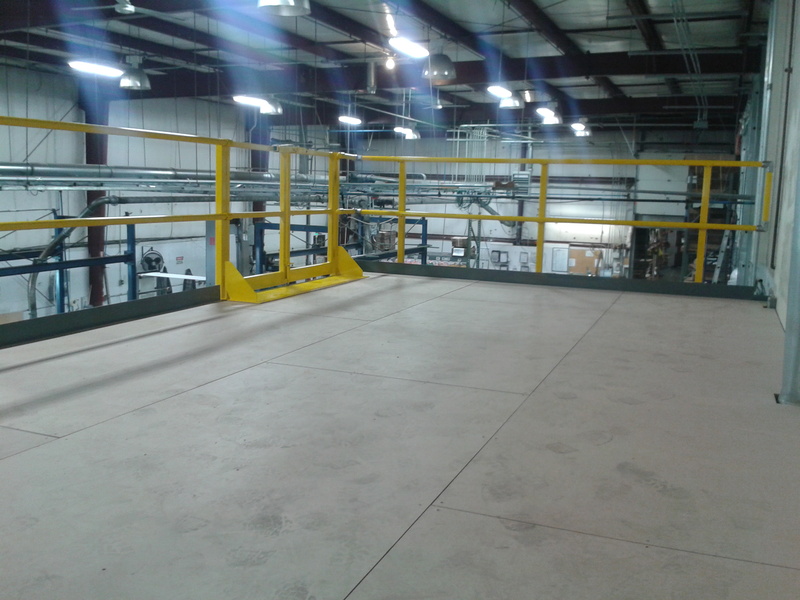 Our powder coat yellow gate closely matches their existing handrail in both the color and rail dimensions. The gate swings one way, but it can be flipped on the horizontal and vertical axis to achieve a left hand swing, a right hand swing, and a swing in, or swing out. In this instance the existing handrail was a 1-1/2” sq. tube so they were able to bolt the gate to their handrails using the supplied U-bolts. Installation took about five minutes per safety swing gate. Be aware that lift trucks cannot stop suddenly. They are designed to stop slowly to minimize load damage and maintain stability. Stand clear of lift trucks in operation. Avoid a run-in. The driver’s visibility may be limited due to blind spots. Be aware of the wide rear swing radius. Use pedestrian walkways, or stay to one side of the equipment aisle. Never pass under an elevated load. 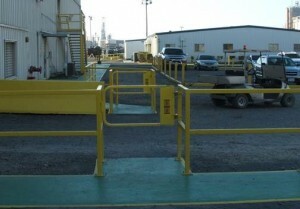 OSHA suggests that plant managers separate pedestrians from lift trucks by providing pedestrian walkways with permanent railings or other protective barriers, adequate walking space at least on one side, if pedestrians must use equipment aisles or pedestrian walkway striping on the floor, and/or if barriers cannot be used. For the above customer, our MLG ladder safety gates helped them meet OSHA standard 29 CFR 1910.176(a) in a cost effective and safe manner. This entry was posted in Safety Gates on July 16, 2014 by Brett. 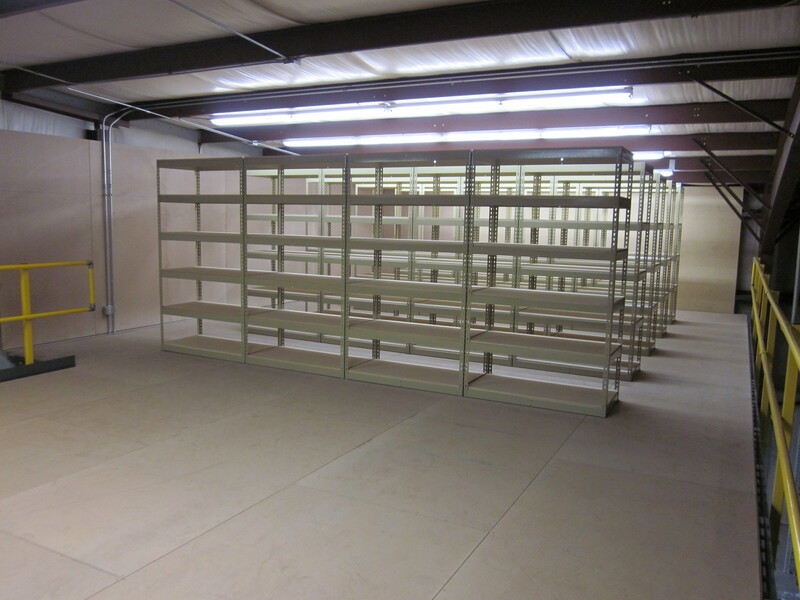 We were contacted by a customer who had an existing walled off area on their floor that they were using for long-term storage. They were running out of room and asked us to build a platform above it, as well as to span over another adjacent room to expand their storage space. 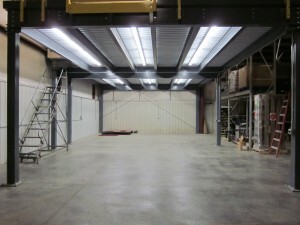 Overall, the platform was to be 42’ wide x 12’ deep in order to stretch over both rooms. 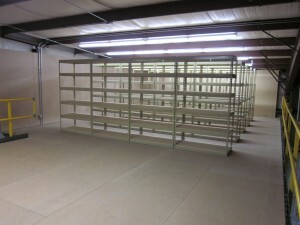 We needed to maintain a 10’ clearance height under the platform to clear their existing walls, and the deck was designed for light storage at 125 lbs per square foot live load, which would accommodate their light shelving storage as well potential future pallet storage for pallets up to 4’x4’ and weighing up to 2000 lbs. We had to be very careful with the positioning of our columns on this project because the customer didn’t want anything in front of the building that might interfere with their aisle way. We set the mezzanine columns back inside the existing room and extended our deck to the front of the building. Likewise, because the customer wanted to keep the stairs inside the footprint of the platform, the customer requested that we use an OSHA staircase as opposed to an IBC staircase. 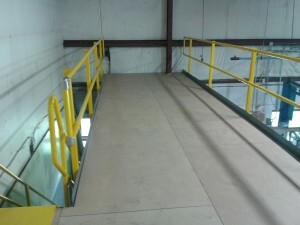 An IBC stair has a more gradual angle of decent with a 7” maximum rise for every 11” tread and requires an 11” handrail extension at the bottom (or in some locations, such as here in Ohio, 23”) An OSHA staircase with generally has around an 8” rise and 9” treads and does not require handrail extensions at the top and bottom. The IBC staircase would not leave them with sufficient room at the bottom between the handrail extensions and the columns to access the stairs, so the decision to go with OSHA freed up some space for them. For the decking we used a corrugated roof deck (painted reflective white) and skinned it with an unfinished ¾” Resindek LD. This gave the customer a nice smooth deck surface up top and was significantly less expensive than a metal deck. The framing was held off the main walls of the building by about 6”in order to clear the base plates centered under the columns, to clear some small ducts and an existing building column the customer had running up their building’s primary walls, as well providing the installers with enough room to bolt the framing together. The decking was then run beyond the framing back to the customer’s walls and trimmed in the field by the installers to go around the customer’s existing building column and ductwork. The materials were shipped out on a tarped dedicated flatbed, and were delivered the next day. The customer unloaded the materials and staged them indoors near the work area. They cleared out the room that we would be building in, and with no existing roof in the room that would otherwise need to be removed, they were all set for our installers. Installation began on a Monday morning, and everything was wrapped up with another happy customer by lunch on Thursday. This entry was posted in mezzanines, stairs on July 7, 2014 by Derick.